South Carolina has long been a bastion of Southern art and culture, and some prime examples of that legacy will be on display at the Morris & Whiteside Hilton Head Art Auction on Hilton Head Island Oct. 5. The auction, which will also take place online at iCollector.com, offers appreciators of Southern art the chance to take home works celebrating the region's history and natural beauty, as well as depictions of European landmarks produced by masters who have plied their craft in South Carolina and its surrounding environs. Over the course of his more than 70-year career, Ray Ellis has become one of the most celebrated masters in contemporary American art. Along with his paintings, Ellis' many books on art, including a series he co-wrote with Walter Cronkite in the 1980s, helped to launch him into the stratosphere of American painters. His reputation was further cemented beginning in 1998 when, for three straight years, he was commissioned by the President to paint scenes of the White House that were then reproduced for the official Christmas card. Now, you can add some of Ellis' oil works to your own personal collection, including "Hide & Seek" (lot #95), which portrays children playing the eponymous game in a lush garden, and a painting with a similarly descriptive title, "Marsh Heron" (lot #35). Among the other oils featured at the Oct. 5 fine art auction will be "Mostar Bridge" by Clark Hulings (lot #68), "Laid Back" by Dean Mitchell (lot #96) and "Louisiana Arabesque" by Walter Greer (lot #65). Stephen Scott Young is another famous painter with Southern roots. His famous watercolors depicting life in the South have made him an icon of the medium, and one of his most famous works, "Lefty," which shows two young boys playing marbles in front of a clapboard house (lot #86), will be one of the headlining items come October. Another of Young's paintings, "Salvador's" – a breathtaking interpretation of a boat dock – will be among the vast collection of watercolors up for bid. Other works from that genre available at the auction will include a series from Margaret Petterson – "Palmetto I," Palmetto II" and "Palmetto III" (lots 72a, 72b and 72c) – and Joe Pinckney's "Brown Pelicans" (lot #14). Of course, paintings won't be the only pieces of art garnering a lot of attention, and bidding, at the Hilton Head and online art auction. Sculpture will have a prominent place, as well. The "Eat More Beef Monument #6/75," a bronze of a giant hog by Sandy Scott (lot #116), might be the most startling submission in the category, and it's certainly the largest, coming in at a little more than 4 feet tall. On a slightly smaller, yet no less impressive, scale, Glenna Goodacre's "Liza #5/25" (lot #83) is an immaculately detailed carving of a young girl resting her hand on her chin. There will be so many beautiful and singular works available on Oct. 5 that you will probably want to spend some time perusing your options in preparation for the sale. 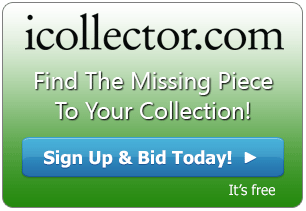 Luckily, iCollector affords you just that opportunity, with a full rundown of the inventory on its website.